Last year, I had the pleasure of visiting the set of Kim Jee-woon's The Last Stand, the American directorial debut of The Good, the Bad, the Weird. My report from the set is coming sometime before the end of the year, but the hype machine is already in full swing for the action packed film marking the first lead role for Arnold Schwarzenegger since returning to Hollywood as an actor. The second trailer brought plenty of bullets and explosions, and now a new poster gives Schwarzenegger a big gun (bigger than he had on the first poster) and a goofy counterpart in Johnny Knoxville. This movie could be fun, right? 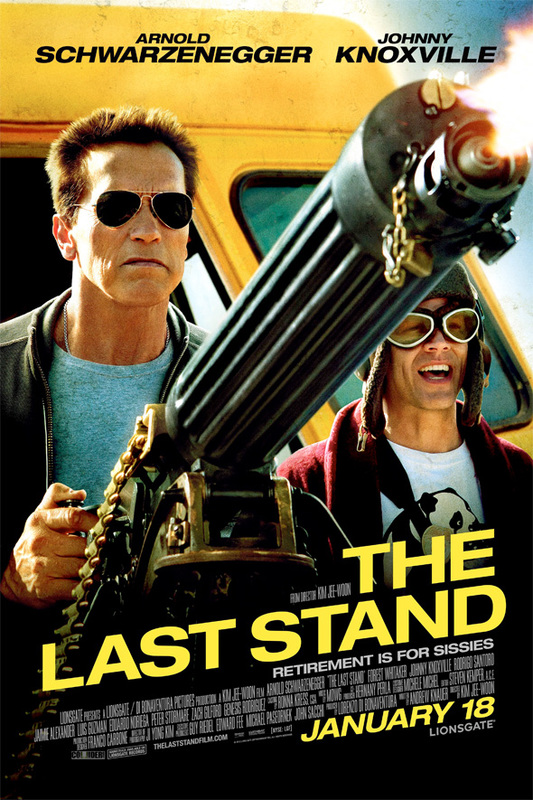 The Last Stand marks the English-language debut of director Kim Jee-woon (I Saw the Devil, The Good, the Bad, the Weird) working from a script by Andrew Knauer, Jeffrey Nachmanoff, and George Nolfi (The Adjustment Bureau). The film follows Arnold Schwarzenegger as a former LAPD cop turned sheriff of a small border town which serves as the last thing standing between the world's most notorious drug kingpin and freedom in Mexico after he escapes from an FBI prisoner convoy. Forest Whitaker, Zach Gilford, Harry Dean Stanton and Luis Guzmán and more also star in Last Stand, hitting theaters on January 18th, 2013. He's too old to play an aging sheriff?? Too old to play action hero. He can still play older characters though. Like King Conan. So you must think DeNiro and Pacino are the living dead? You're an idiot. Hey, why you getting abusive. BTW Arnie said it himself that he's too old in the trailer, I dare you to say it to him. Wow thats some great photoshop work - they've shaved off 20 years! Wait till they can do this for the full length of a film - its coming vfx folks are testing it already.